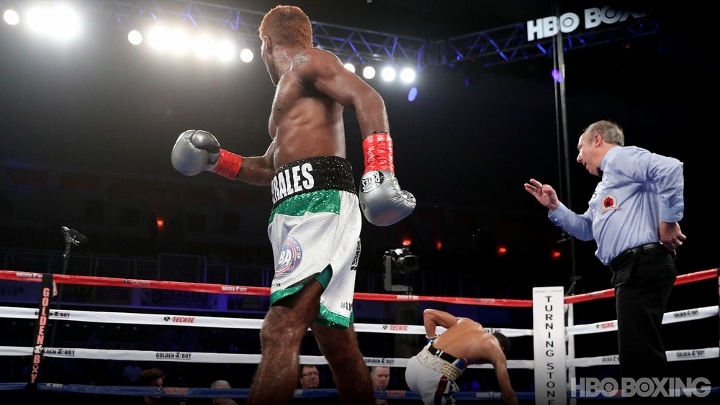 Jezreel Corrales: I Was Winning on All 3 Cards, I Want a Rematch! At Turning Stone Casino in Verona, New York, unbeaten featherweight Alberto Machado of Puerto Rico scored an eighth-round knockout of Jezreel Corrales to claim the World Boxing Association super featherweight belt. Photo by Ed Mulholland/HBO. Panama’s Corrales had lost the title on the scale on Friday when he failed to make weight for the bout. He was ineligible to regain it on Saturday, but that proved moot as Machado recovered from a fifth-round knockdown to seize the title, improving to 19-0 with 16 knockouts. Machado came back from the knockdown to hurt Corrales in the sixth and in the eighth he produced a combination that knocked out the Panamanian at 2:15 of the round. In what was a hard-fought battle between two southpaws, Corrales earned an early advantage by being much quicker and skillful. The native of San Miguelito, Panama also landed hard overhand lefts repeatedly, eventually dropping Machado with that same punch in the fifth round. Little by little, though, Machado's size and strength advantages began taking a toll on Corrales, who was hurt by a right hook in round six. Then, in the eighth round, Machado ended matters abruptly after the two exchanged left hands that had only one man hit the canvas: Corrales. After barely making the count, the fight was stopped at 2:18 of the eighth-round, making Machado, of San Juan, Puerto Rico, a world champion. The ex-champion felt he was winning the fight, and he was right. At the time of the stoppage, the judges had Corrales winning with two scores of 68-64 and one score of 67-65. "I want a rematch," said Corrales. "At the end of the day, I know I was winning in the cards and that I gave a beautiful performance. We went head to head and both of us weren't scared to exchange. It happens in this sport - one punch can take you out."